Our ministries are accomplished through a variety of church groups that are open to all members and friends and that provide opportunities to serve and become acquainted with others who share similar interests. In the listing below, links are provided for groups that have a dedicated website page where you can read more. Within categories, groups are listed alphabetically. Click the following links to jump to specific categories. The ministries listed here provide opportunities for spiritual growth and for becoming acquainted with others who share similar interests. Click the group name links for more information. • Book Discussion Group – The group meets for dinner monthly to discuss books. Contact Pam Springsteel at 573-445-0642 or by email. • Chalice Circles – Chalice Circles are groups of 7 to 10 members who meet once or twice a month to deepen and strengthen interpersonal connections and encourage spiritual growth. Contact by email. • Conversations Etc. – Conversations Etc. is a women’s group that meets monthly at church for lunch and conversation. Contact Pam Springsteel at 573-445-0642 or by email. • Dining Group – Dining Group suppers are scheduled for groups of eight in members’ homes from October through March, with a break for the all-member Holiday Party in December and the all-member dinner at the church in the spring. Contact Linda Lou Brown at 573-446-3939 or by email. • Grieving Circle – Grieving Circle is a safe, affirming place that gathers as needs arise for those with broken or aching hearts to give voice to their grief, whether out loud or in silence. Contact by email. • Kaleidoscope – Kaleidoscope is an eclectic pagan group seeking to explore members’ relationship to the earth and the cosmos through the study and practice of shamanic and ancient religious traditions. Contact by email. • Life Writers – Life Writers write mini-memoirs telling stories of their lives and enjoy hearing others’ stories. Contact Fran Reynolds at 573-881-3828 or by email. • Men’s Group – The Men’s Group meets at 8 a.m. on the second, fourth (and fifth) Saturdays each month in the sports bar/restaurant at the Holiday Inn Executive Center for breakfast and conversation. Contact Wiley Miller at 573-864-8574 or by email. • Mindfulness Meditation – Mindfulness Meditation takes place every Sunday morning at church. Meditators of all levels of experience are welcome. Contact Peter Holmes at 573-239-7789 or by email. • Non-toxicMmasculinity Men’s Group – The Non-Toxic Masculinity Men’s Group meets at the church at 7 p.m. Monday evenings. The group serves cisgendered, straight, white men who are actively working to detoxify their masculinity and privilege so that they can stop doing damage to others and learn how to become active allies of other, more marginalized, groups. Contact Jeff Ordway by email. The ministries listed here provide a variety of services crucial to the ongoing operation of our church and are open to all members and friends. If a group has a dedicated page on our website, you can click the group name link for more information. • Accessibility & Inclusion Ministry (AIM) Team – The AIM Team seeks to create an inclusively designed environment, free from ableism, where all individuals feel welcome and are able to participate in every aspect of our church. Contact either co-chair, Gretchen Maune (573-489-0986 or email) or James Cutts (573-489-0879 or email). • Audit Committee – The committee conducts an annual audit of church financial records and assists the Board of Trustees in arranging periodic outside audits. Contact through the board by email. • Board of Trustees – The board is the governing body of the church. Its responsibilities are making policies, effectuating the church’s vision and mission as articulated by the members, providing resources, and evaluating programs. Contact the board by email. • Caring Ministry Team – The team provides support in times of celebration and challenge. Support may include cards, calls, visits, meals, and assistance with errands, transportation, or other needs. Contact either co-chair, Meredith Donaldson (573-289-3018 or email) or Winifred Scott (573-234-1959 or email). • Committee on Ministry – The committee meets regularly with the minister to help evaluate the church’s ministries and to promote open and appropriate communication among the minister, the board, ministry teams and the congregation. Contact the minister at 573-442-5764 or by email. • Denominational Affairs Team – The team acts as a liaison between our congregation and the Unitarian Universalist Association and the MidAmerica Region. Contact Steve Scott at 573-442-1865 or by email. • Facilities Team – The team helps keep our physical facilities in good condition. It is responsible for maintenance and repair of the church building. Contact Peter Holmes at 573-239-7789 or by email. • Fundraising Team – The team plans and executes fundraising activities to supplement the church’s income. Contact the minister at 573-442-5764 or by email. • Grounds Team – The team works to develop and maintain our church’s grounds in an earth-friendly and sustainable way and to encourage people of all ages to interact with the beautiful outdoor space around our church. Contact either co-chair, Jeanne Murphy (573-219-8974 or email) or Patty Daus (573-529-9691 or email). • Investments and Endowment Committee – This Board of Trustees committee manages the financial investments of the church and makes recommendations to the board. Contact through the board by email. • Media Team – The Media Team works to create a vibrant virtual presence for UUCC. Contact Larry Lile at 573-397-5414 or by email. • Member Connect Team – The team assists church members and friends in finding their place in our church community through deeper connection, service, and spiritual exploration. Connectors are available to have a conversation with every member/friend who is interested. Contact either co-chair, Peter Holmes (573-239-7789 or email) or Rosie Geiser (920-470-2818 or email). • Memorial Garden Team – The team maintains and plans improvements to the Memorial Garden in the wooded area behind the church. Contact Jeanne Murphy at 573-219-8974 or by email. • Nominating Committee – This Board of Trustees committee is responsible for (1) nominating church members to serve on the Board of Trustees, (2) recruiting members for board committees, and (3) recruiting delegates to the MidAmerica Region Assembly and UUA General Assembly. Contact through the board by email. • Office Volunteer Team – Team members work in teams of two or three to copy and collate the weekly Order of Service and announcement inserts. They also assist with other church office tasks as needed. Contact Church Administrator Suzanne Clark at 573-442-5764 or by email. • Peace Building Team – The team seeks to prevent and resolve conflicts by providing education about conflict resolution and facilitating conflict resolution in an atmosphere of openness, respect and trust. Contact Caya Tanski-French at 573-447-2915 or 573-673-3925 or by email. • Personnel Team – The team assists the minister in developing and implementing personnel policies, advising on hiring and personnel practices, and resolving personnel issues. Contact the minister at 573-442-5764 or by email. • Publicity – The team works to communicate about the church through the monthly newsletter and website and assists church staff with public relations. Contact Steve Scott at 573-442-1865 or by email. • Safer Congregation Committee – The committee’s primary responsibility is to develop, update and monitor the implementation of the safer congregation policies and procedures adopted by the Board of Trustees and related administrative policies and procedures adopted by the minister. The committee also serves as a review and response team when a person participating in the church has a history of one or more sexual offenses or has been accused of a sexual offense. Contact the minister at 573-442-5674 or by email. • Stewardship Team – The team plans and manages the annual campaign to obtain financial pledges from church members and friends to fund the church budget. Contact the minister at 573-442-5764 or by email. • Technology Team – The team works to maintain the church’s computer, sound and other technological systems and recommend improvements. Contact Larry Lile at 573-397-5414 or by email. • Welcoming Team – The team’s mission is to make visitors feel welcome, to guide people into membership, and to facilitate the integration of new members into the life of the congregation. Contact Kevin Fritsche at 573-289-4536 or by email. 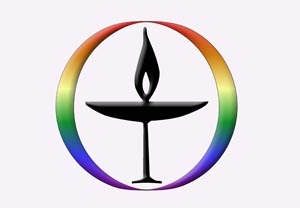 The ministries listed here work to promote our Unitarian Universalist Principles in local, regional, state, national and international realms. They are open to all interested church members and friends. Click the group name links for more information. • Festival of Sharing – We participate annually in the Festival of Sharing, an interfaith project to collect supplies needed by people living with injustice, poverty, hunger, high infant and maternal mortality and crises. Contact Bonnie Johnson 573-442-4440 or by email. • Green Sanctuary Team – The team engages in environmental justice and climate justice activities that seek to live fully our seventh principle, respect for the interdependent web of all existence of which we are a part. Contact Ellen Thomas at 573-999-4615 or by email. 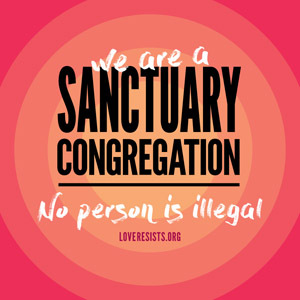 • Sanctuary Congregation Team – The team works to protect immigrants facing deportation by literally offering sanctuary to people at risk of being deported and seeks ways our congregation can support immigrant and refugee communities in this area. Contact Rev. Dottie Mathews at 920-378-4013 or by email. • Stream Team – The team periodically monitors the health of a section of Hinkson Creek, which is on the federal list of impaired waterways. Contact Peter Holmes at 573-239-7789 or by email.